Where is it ? About 110 Kilometres west of Faro. About one Hour thirty minutes by car. How big is it ? Pretty small, the local region of Aljezur is not the most populous spot and Carrapateira has less than 1000 local inhabitants. The population of course swells during the Algarve summer season. Who goes There ? Surfers and Nature enthusiasts but considering the beauty of the area and the magnificent beaches at praia de Amado and Praia de bordeira surprisingly few. Whats about Food and accommodation ? Carrapateira is popular with campers it is rarely too busy and has enough guest lodges and villas to cope but dont expect a huge choice. Local cuisine is typically western Algarvian and is rustic and simple. expect some of the best Octopus in the Algarve. Carrapateira is a small, unremarkable but pretty village located on the West coast of the Algarve. As you drive up the hilltops into the town you will be hit by the aroma of pine and eucalyptus. Carrapateira doesn’t have much of a tourist trade and is in a rural part of the west that attracts strong westerly winds. The beaches however attract a large watersports gathering particularly wind sports and especially windsurfing. There is a choice of two fantastic beaches around Carrapateira. Praia de Amado is very popular with surfers and has local clubs that hire out equipment and offer Algarve surfing lessons. An Algarve surf camp takes place at various times during the year and the beach is host to many surfing competitions sometimes with an international field. Praia de Amado is rated as an intermediate white water surf but the swell from october to february is a test for experienced boarders. 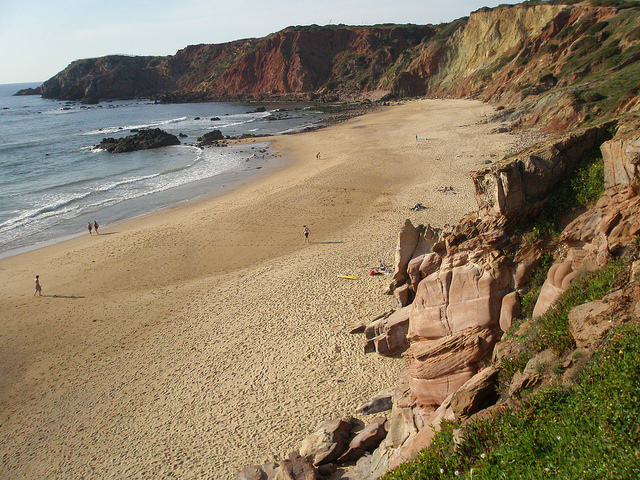 About four kilometres north is the Praia de Bordeira. Many beaches along the west coast of the Algarve are mountainous affairs that are only accessible with steep descents down a cliff path. The praia de bordero is an accessable deep stretch of beach that runs for miles. Backed by rows of sand dunes that are populated with local high cacti, making them a wind sheltered spot excellent for camping. If you travel east of the beach up towards the limestone cliffs leading to the village you will see some enthusiastic and brave local fishermen clinging to the face with their lines dangling. People who are on the historic trail of the Algarve will want to visit the old Chapel of Carrapateira the Nossa Senhora da Conceicao dates back to the late seventeenth century and is surrounded by ruin of fortifications built-in the early eighteenth century to protect it from pirate raids. More accommodation and eateries can be found in the nearby town of Boardeira. Which has seen some recent building and updating of older buildings to try to attract a more touristic crowd coming to this beautiful part of the western algarve.